You enter the church by the south porch. The inner arch over the main door is Norman in design, dating from about 1150AD – the earliest stonework in the church. Over the outer arch to the south porch is an early English sundial (c1220). Above the porch is a small priest’s room, entered by a narrow stairway inside the church. This room has two lancet windows which contain mediaeval glass, the oldest in the building. One faces south over the entrance, the other into the south chapel. The parish church of All Saints was built in the 12th century, with tower, clock and bells being added in later centuries. The church has been designated by English Heritage as a grade 1 listed building. The large churchyard contains several monuments to the Tynte family which gave its name to the nearby Tyntesfield Estate, which was purchased in 2002 by the National Trust following the death of Lord Wraxall. The church tower has a peal of eight bells in the key of E flat. The weight of the tenor bell is just over 22 cwt. The oldest bells were cast by Edward Bilbie of Chew Stoke in 1705. In the period from 1698 to 1723 Edward Bilbie was responsible for the casting of 67 bells for churches all over Somerset. 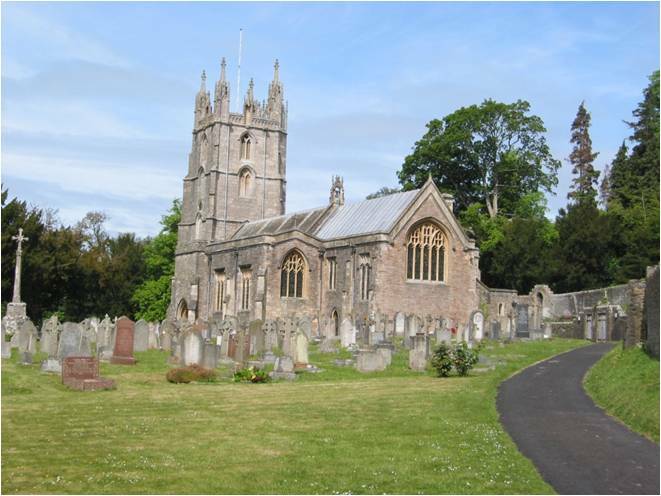 It is not known how Edward Bilbie learnt to cast bells, but it is clear that he cast his first bell in 1698 for St Andrews Church in Chew Stoke. 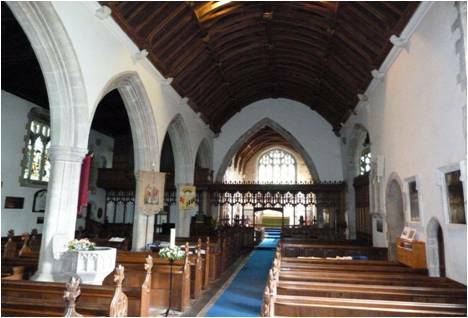 The nave has a timber roof, supported by stone corbels representing the heads and headdresses of well-known people from 500 years ago. The font is octagonal, probably fifteenth century. It has a stone book rest, supported by a demi-figure of an angel, to hold the service book during baptisms. The chancel is entered by the fine screen of oak erected in 1893/94 during the restoration of this part of the church. An east window, altar and reredos were also created, with a new roof and choir stalls. The reredos is made of Bath stone and is unique among the churches of old Somerset in that it depicts the Transfiguration of Christ. Peter, James and John kneel at the feet of Christ, with the heads of Moses and Elijah on either side. There are North and South chapels, the former now serving as a choir vestry. There is a separate Clergy vestry. The organ was built in 1870 and moved to its present position on the chancel screen in 1892. An electric blower was added in 1924 and it was rebuilt in 1982 by Percy Daniel & Co, a local organ builder. These recumbent effigies are on a tomb chest with the family's coat of arms. 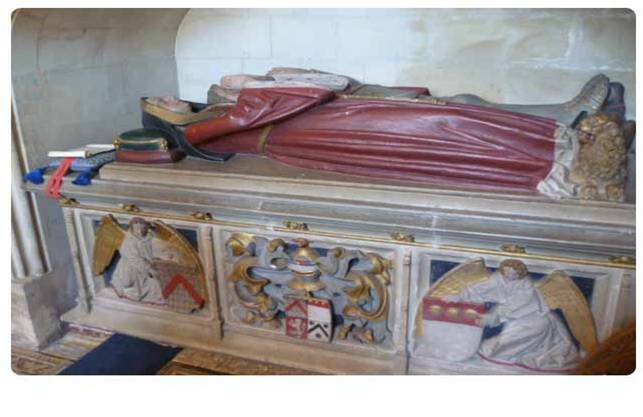 The two effigies show the Lady Anne Howard in a fashionable long flowing gown and hood. She was the great aunt of two Queens of England – Anne Boleyn and Catherine Howard – both wives of Henry VIII. At the foot of Lady Howard is a small lion. Her husband in his suit of armour with weapons at the foot of the knight lies his faithful pet dog . The Gorges were for a long time Lords of the Manor at Birdcombe Court. The Gorges Tomb can be found In the recess to the north of the altar.